“Old dogs are vulnerable. They show exorbitant gratitude and limitless trust. They are without artifice. They are funny in new and unexpected ways. But,above all, they seem at peace. I love an old dog. I just do. If you are reading this with your old. lumpy, white-faced friend snoring at your feet, dumpster breath wafting through the air, well, consider yourself blessed. For some of you, it may be your last old dog, growing old for humans or dogs is not guaranteed. I had an old dog, Bailey, who died two years ago at age 14, ancient for a Labrador. I have missed the company of an old dog since. I don’t wish to rush the lives of my current Labs in residence, but I will admit that the sight of gray hair on my black Lab’s chin recently, made me smile. He will be the sweetest old man..if we are lucky. My love for an old dog found me tip-toeing out my home very early Sunday morning to steal my son’s pet sitting gig. Lucy, my neighbor’s dog, a 14 year old Golden Retriever(? )/I’m Not Really Sure Mix, awaited, and I was only too happy to oblige this Queen of Forest Spring Lane. 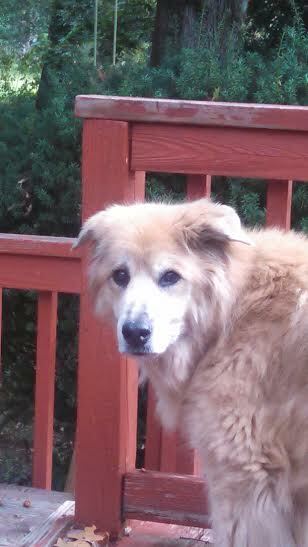 Lucy and I sat outside together on her deck for quite sometime on a glorious, end of heatwave Sunday morning. I watched her pick up the messages in the cool breeze, her nose dancing, lifted towards the skies. She surveyed her yard with such regal demeanor..I imagined her back in the day, where she must have been a force for the critters or strangers to deal with, if they dared to enter. She just saw her last kid off to college, and in her old age, looked after her Master who suffered very serious injuries in an accident. It was such a wonderful sight to see Lucy and her amazing owner back out for their daily walks recently..good job Lucy. 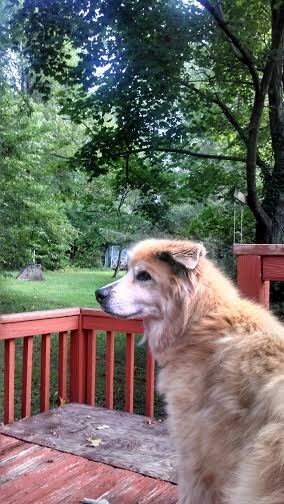 Sitting outside, watching Lucy, I decided to let her tell me when time was up..despite needing a second cup of coffee. It seemed she couldn’t get enough of the crisp air, and I hoped she could hear, or feel the noisy cicadas singing. When she turned away from her post, finally, there was an air of dignity about her, a Queen soon to be stepping down, perhaps. She granted me one stinky lick on the tip of my nose before returning indoors. You’re welcome old girl..and thanks for letting me hang out.